Almost ten years before Osama bin Laden was killed, the United States had the opportunity of a decade to decapitate the organization that so ruthlessly enacted the deadliest foreign attack on American soil in the nation's history. Battles raged across Afghanistan in the 102 days following September 11, from Mazar-i-Sharif to Kabul to Tora Bora. Unfortunately, due to sales rights restrictions, we cannot offer 102 Days of War for sale in your country. Almost ten years before Osama bin Laden was killed, the United States had the opportunity of a decade to decapitate the organization that so ruthlessly enacted the deadliest foreign attack on American soil in the nation's history. Battles raged across Afghanistan in the 102 days following September 11, from Mazar-i-Sharif to Kabul to Tora Bora. Yet bin Laden escaped while al Qaeda and the Taliban endured the initial onslaught. In 102 Days of War, Yaniv Barzilai takes the reader from meetings in the White House to the most sensitive operations in Afghanistan to explain how America's enemies survived 2001. 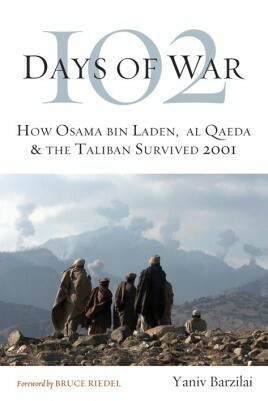 Using a broad array of sources, including interviews with U.S. officials at every level of the war effort, Barzilai concludes that the failure to kill bin Laden and destroy al Qaeda at the Battle of Tora Bora was not only the result of a failure in tactics but, more importantly, the product of failures in policy and leadership. 102 Days of War provides novel information and a new level of understanding about the opening campaign of the U.S. war in Afghanistan. Informed citizens and military historians alike will find compelling this vivid and relevant narrative. Yaniv Barzilai is a Thomas R. Pickering Foreign Affairs Fellow with the U.S. Department of State. Yaniv graduated from the University of North Carolina and is currently pursuing an MA in international relations at the Johns Hopkins School of Advanced International Studies. During the summer of 2011, Yaniv worked for the Special Representative for Afghanistan and Pakistan at the U.S. Department of State. As a Pickering Fellow, he will enter the Foreign Service upon completing his graduate degree. He currently lives in Washington, D.C.